Source: Joseph Haslewood ("Literary Researches into the History of the Book of Saint Albans") in his reprinting of Juliana Berners, The Book Containing the Treatises of Hawking, Hunting, Coat-armour, Fishing, and Blasing of Arms: As Printed at Westminster, by Wynkyn de Worde, the Year of the Incarnation of Our Lord MCCCClxxxxvi  (Harding and Wright, 1801, 1810), p. 59.
with hey go bet / hey go bet howe. there he gothe / there he gothe. 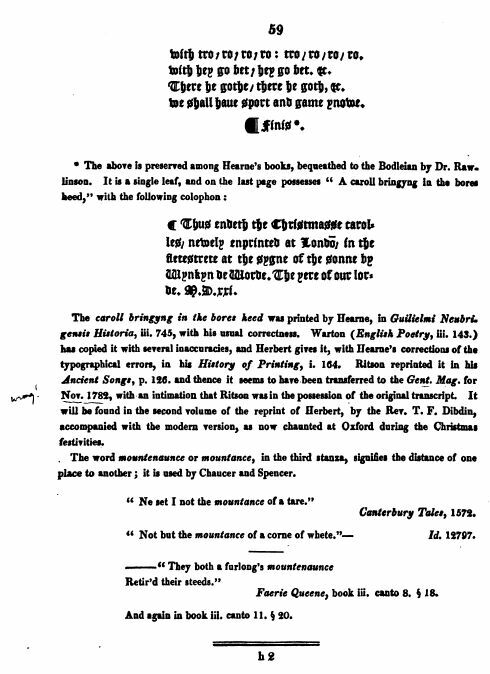 &c.
with hey go bat, hey go bet, &c.
There he gothe, here he goth, &c.
This copy of the carol was printed by Joseph Haslewood in his 1801 reprinting of Juliana Berners, The Book Containing the Treatises of Hawking, Hunting, etc. The rest of the carol is found on page 59 (both pages below). Pages 58 and 59 from Haslewood. Although de Worde has printed this in his 1521 Christmasse Carolles Newly Enprinted, he didn't reprint it in the 1496 Treatises of Hawking, etc., although Haslewood believed that this is precisely the kind of carol that should have been printed in such a book, writing "It would have proved more acceptable had the piece selected been incidental to some one of the diversions; a species of ancient lyrics, of which the specimens are uncommonly rare." 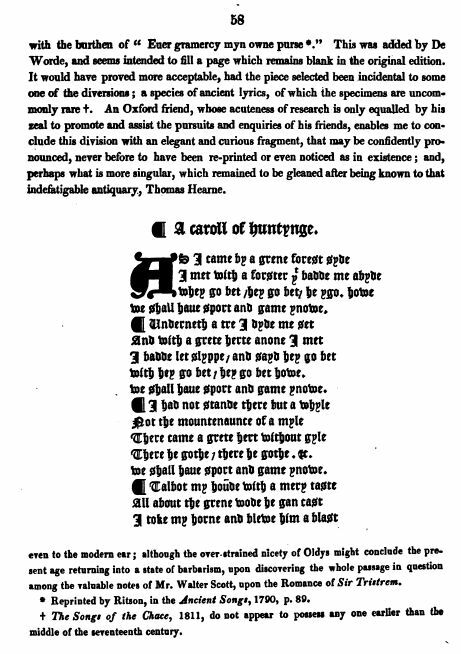 An Oxford friend, whose acuteness of research is only equaled by his zeal to promote and assist the pursuits and enquiries of his friends, enables me to conclude this division with an elegant and curious fragment, that may be confidently pronounced, never before to have been re-printed or even noticed as in existence; and perhaps what is more singular, which remained to be gleaned after being known to that indefatigable antiquary, Thomas Hearne. 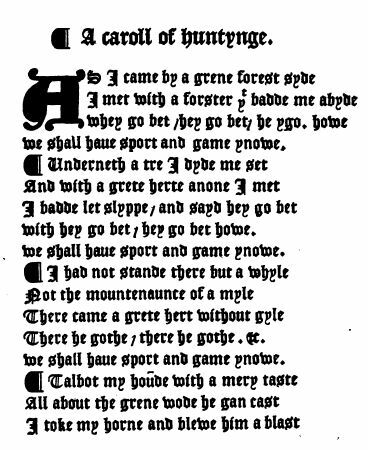 This, then, was the first reprinting of A Caroll of Huntynge since de Worde printed it in 1521, and since it was reprinted in Vol. 3 of Guilielmi Neubrigensis Historia by Thomas Hearne, who told us about the discovery of the Carol in this Note. Haslewood added this note: "The word mountenaunce or mountance, in the third stanza, signifies the distance of one place to another; it is used by Chaucer and Spencer...."
This carol is considered by Richard Leighton Greene and others as being the newer of the two known versions. The other version was printed by London grocer Richard Hill in his early 16th Century Common-place Book. See: As I Walked By A Forest Side - Froude.